Famous Wisconsin Cheddar Cheese Curds - mouth watering deliciousness! Bring them to room temperature and for a delicious, squeaky treat. Light in flavor and great for snacking! The perfect combination of Yellow and White Cheddar Wisconsin Cheese Curds. Served at room temperature they are very Squeaky! Light in flavor and great for snacking! Famous Wisconsin Dill Garlic Cheese Curds. Laced with Dill and Garlic throughout each curd. Serve cheese curds at room temperature for full fresh flavor. Great for snacking, the Wisconsin cheese curd is known for being the perfect snack food. Also melted and served to create delicious burgers, pizzas, poutine, etc. Wisconsin Jalapeno Cheese Curds. If you like it "hot" these curds are blended with Jalapeno Peppers throughout each curd. Serve cheese curds at room temperature for full fresh flavor or melted to create delicious burgers, pizzas, poutine, etc. Famous Wisconsin Taco Cheese Curds. These are spiced curds with full taco flavor. Serve cheese curds at room temperature for full fresh flavor. Great for snacking or serve melted to create delicious burgers, pizzas, poutine, etc. Wisconsin Tomato Sweet Basil Cheese Curds. Cheddar cheese uniquely blended with dried tomatoes and sweet basil throughout each curd - these are a true specialty & great for snacking! Wisconsin Buffalo Wing Cheese Curds. Mixed with Spicy Buffalo Wing flavor these curds are "Hot". Serve cheese curds at room temperature for full fresh flavor. Great for snacking, the Wisconsin cheese curd is known for being the perfect snack food. Also melted and served to create delicious burgers, pizzas, poutine, etc. Wisconsin Hickory Hollow Cheese Curds. The Hickory Curd is full of smoked cheese flavor. Serve cheese curds at room temperature for full fresh flavor or melted to create delicious burgers, pizzas, poutine, etc. Wisconsin Bloody Mary Cheese Curds. Perfect to serve with the drink, these cheese curds are blended with Bloody Mary Spice flavors throughout. Serve cheese curds at room temperature for full fresh flavor. Great for snacking, the Wisconsin cheese curd is known for being the perfect snack food. Also melted and served to create delicious burgers, pizzas, poutine, etc. 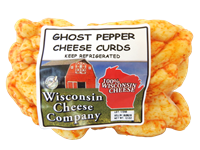 Wisconsin Ghost Pepper Cheese Curds. A very hot cheese curd blended with Ghost Chili Pepper, one of the hottest peppers in the world, for that extra kick! Serve cheese curds at room temperature for full fresh flavor.